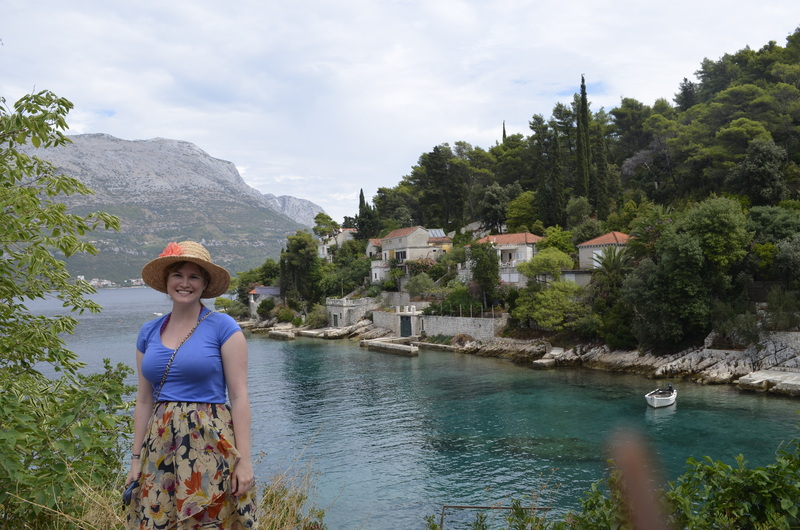 I’ve added another country to the list of amazing places I’ve visited – Croatia! Before moving to London I spent a week traveling the Croatian coast with my friend Lisa. I’m not really sure how we ended up deciding to go to Croatia, it’s not really the most visited tourist destination, but we’d both heard it was really nice and a quick google search confirmed that it was indeed very beautiful. In case you don’t know anything about Croatia, let me bring you up to speed! It’s a small country in Eastern Europe that borders the beautiful Adriatic Sea, along with Slovakia, Serbia, and Bosnia. It was a former part of Yugoslavia and was at war in the early 90’s when it left Yugoslavia and became an independent country. This fact bothered my mother a little bit at first, but it is now a perfectly safe and lovely place to visit! I met Lisa in Plitvicka National Park at the start of September. Unfortunately, it rained on us while we we’re in the park, but it could hardly take away from the natural beauty of the place. 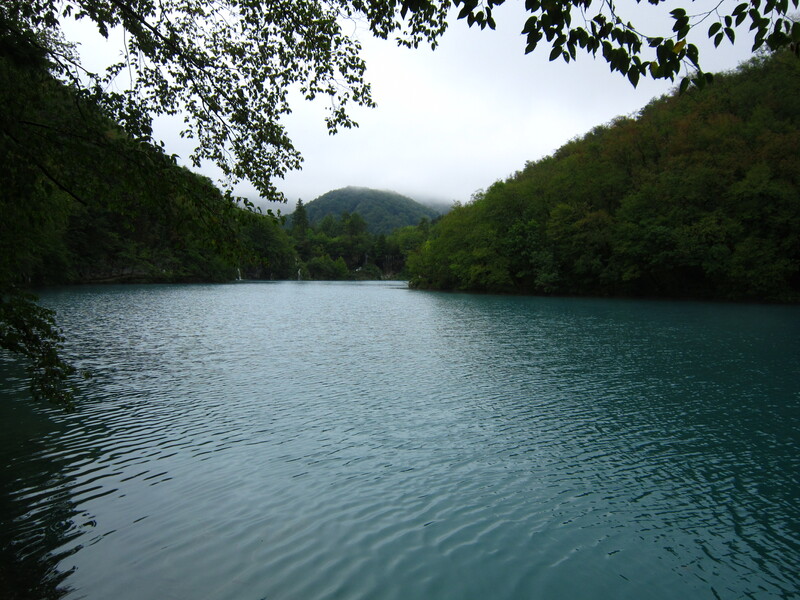 The park is a series of lakes flowing down from the mountains. The ground is all limestone and so over many years the water has slowly been forming caves, tunnels, and springs in the topography, resulting in beautiful rivers and waterfalls! We spent the day hiking through the park and enjoying nature. Fortunately, it didn’t really start pouring on us until the second half of the hike, so we managed to get some nice pictures. After that there was really no hope for us and by the time we arrived back at the hostel we were completely soaked through! After leaving the park, we went to the town of Split. It’s located along the coastline and from there we went from island to island, enjoying the crystal waters of the Adriatic Sea! The first island we visited was Hvar. 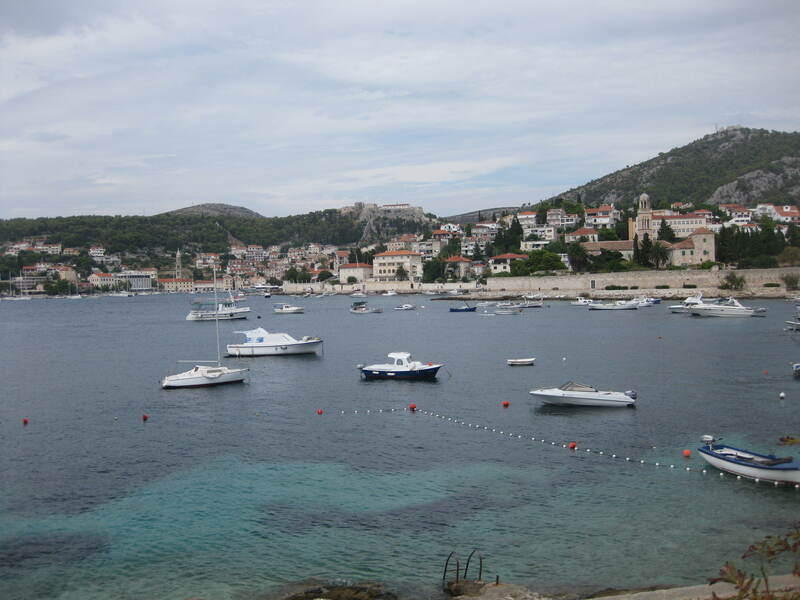 The town of Hvar is situated right at the foot of the mountains, as they rise up out of the sea. The town itself is completely made of stone; staircases and alleys seem to go on forever up the mountain. We watched quite an impressive lightning show one night from the waterfront. The storm hadn’t yet reached us, so we had a great view of the streaks of lightning as they lit up the sky all around us! The beaches in Croatia are not your typical sandy beaches – in fact, Croatia has very few sandy beaches at all! The shoreline is made up of large rocks that fall into the sea and small pebble beaches. I always used to think of sandy beaches as ideal, but the pebble beaches in Croatia were also amazing! The water is incredibly clean and clear no matter where you go, so you can just jump into the water from the rocks whenever you feel like swimming! Lisa and I took full advantage of this and spent much of our time lounging on the beaches whenever we felt like it! The second island we visited was Korcula. By this point, we had developed a pretty solid schedule for our days. We hadn’t planned much for activities and wanted to spend our time relaxing, so we would generally head out exploring in the mornings to see what we could find. It was very hot and humid, so we would walk until we got tired and then we would find a nice place to go swimming and relax! Our lounging in the sun was usually split up with a search to find food and then we would go back to tanning and reading on the beach! Our last stop was Dubrovnik, the main tourist destination in Croatia. It’s located right at the very southern end of the country, so we had to travel down the rest of the mountainous coastline to get there. Arriving in Dubrovnik was one of the rainiest mornings I have ever experienced. The entire city is built on the side of a mountain and rain was running down the roads like rivers! We got a taxi to our hostel because it was so wet and the rainwater was up past the tires of the car! We arrived safe and sound though and it didn’t take long after for the rain to clear up. 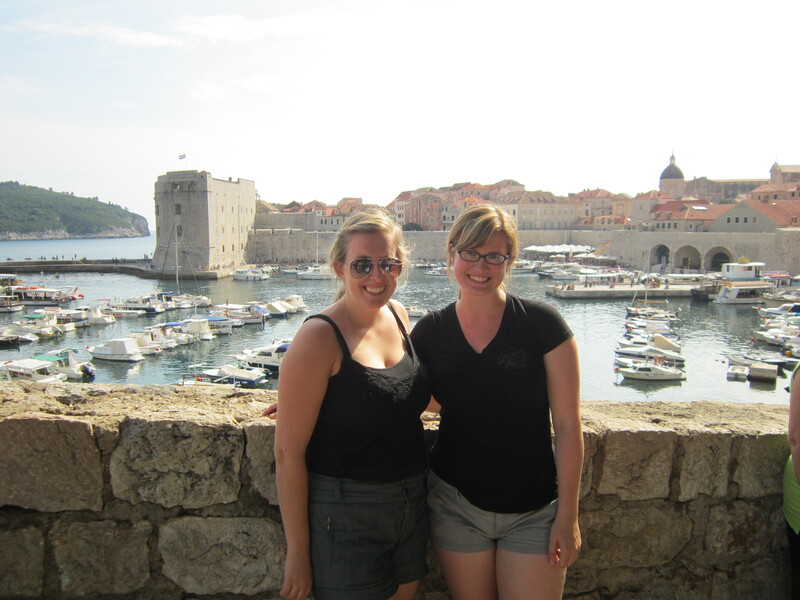 We decided to try and actually learn a little bit about Croatia when we were in Dubrovnik. We went on two walking tours, one about the war in the 90’s and the second about the history of Dubrovnik. The center of the city is called the “Old Town” and it is completely surrounded by castle walls. 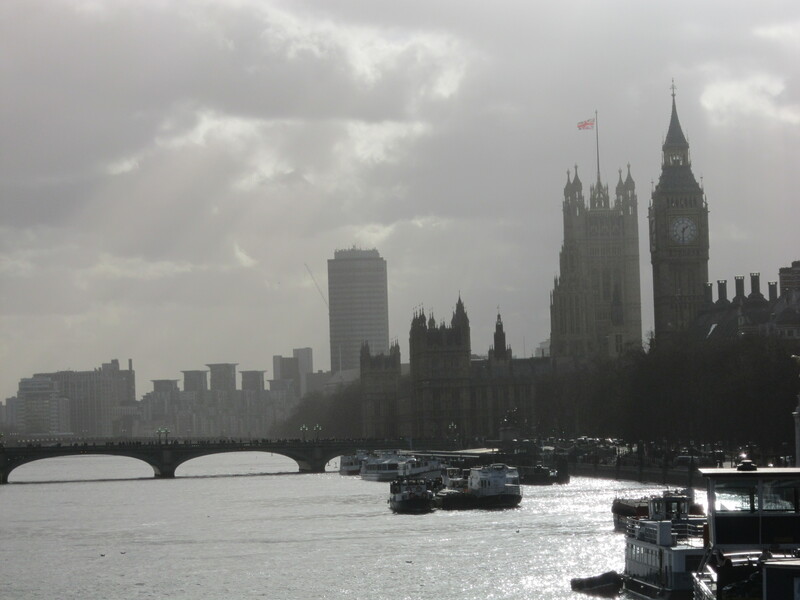 The city has been around for centuries and for years it was a UNESCO World Heritage Site. 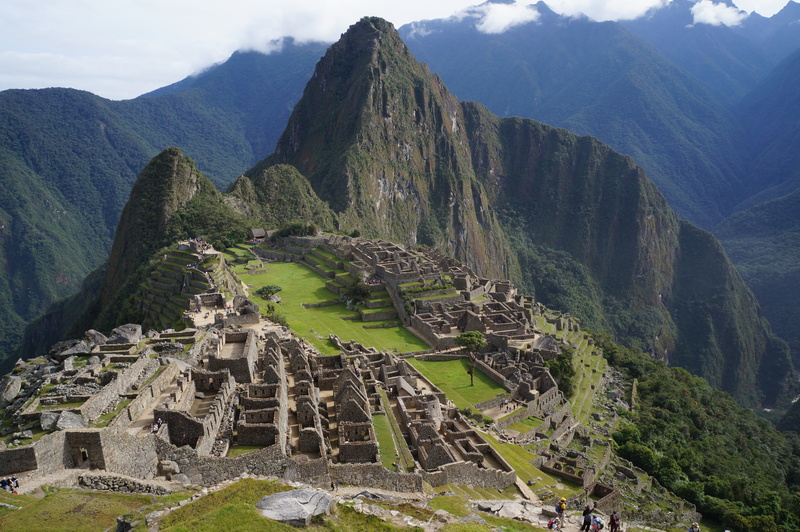 Unfortunately, the city was besieged and attacked in the mid 90’s and due to all of the damage it lost its UNESCO title. Most of the city has been restored, but it’s a bit surreal to walk through the city and still see scars of war. It was a little hard to grasp that the war in Croatia had taken place during my lifetime and that I knew so little about it. Overall, it was an incredible trip! Croatians are very friendly people; everyone we met went out of their way to help us out and make us feel at home. Part of the appeal of the country is that it’s not a huge tourist destination and so you can actually experience a little bit more of what Croatia is really like (except in Dubrovnik; the cruise ships stop there so it is tourist central). It’s also pretty cheap compared to the rest of Europe. Altogether, it was another fun and successful trip! Very educational and the scenery is amazing!